SANFRANCISCO - Six years after the space shuttle Columbia disaster, acommercial space company is fighting NASA for $8 million in compensation for abiomedical experiment that crash-landed in a Texas parking lot. Withoutthat compensation the company, Instrumentation Technology Associates (ITA) ofExton, Penn., will be forced to give up promising cancer research, according toJohn Cassanto, ITA president and chief executive. ITA'sshuttle payload was experimental hardware designed to grow high-qualityurokinase crystals. ITA had been studying urokinase, an enzyme that plays a keyrole in cancer metastasis, for 14 years through ground-based studies andresearch in space. Afteranalyzing the results of previous experiments, ITA officials determined that alonger period in microgravity and an extremely pure protein solution wereneeded to achieve the goal of growing crystals so large that scientists wouldbe able to create a 3-D model of the molecule. Doctors and drug developerswho work with ITA say success in mapping the precise structure of urokinase wouldaccelerate the development of drugs to inhibit metastasis. WhenColumbia broke up during re-entry Feb. 1, 2003, researchers mournedthe loss of life and assumed that all flight hardware was also lost. Withinhours, however, newspapers began publishing photos of debris scattered fromCalifornia to Louisiana. A New York Times photo published Feb. 2, 2003,showed ITA's flight hardware charred but intact in a parking lot inNacogdoches, Texas. Cassanto immediately began calling NASA officials to requestaccess to ITA's experiments. "We just could not get anybody's attention,"Cassanto said. NASAdenied ITA access to its experiments for more than three months while thehardware was stored in a Kennedy Space Center hangar. Before the disaster, NASAagreed to give ITA access to its payload within two hours of the shuttle'slanding, according to the payload integration plan. Dueto the lack of temperature control in the hangar and the three-month delay, theurokinase crystals dissolved back into the protein solution, according to a2004 report by the American Institute of Aeronautics and Astronautics,"STS-107 Mission after the Mission: Recovery of Data from the Debris ofColumbia." Other experiments survived the crash, including an ITA effortto microencapsulate, or coat, tiny particles of cancer drugs. "Allmicrogravity teams growing protein crystals want to get to the samples as quickas possible because of the danger of the crystals going back intosolution," Cassanto said. ANASA contractor also expressed concern that science data was being lost due toimproper storage. 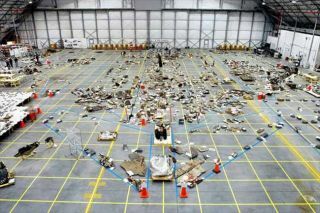 On March 4, 2003, Britt Manfredi, a contractor working at theJohnson Space Center, sent an e-mail to NASA headquarters, NASA centers and theSTS-107 mission managers and scientists urging agency officials to"identify payload hardware with potentially recoverable science data"and move those items to Johnson where they could be kept "in anenvironmentally controlled room to help preserve the data." Instead, theITA payload was stored in the Kennedy hangar until May. Despitethe loss of the Columbia experiment, Cassanto has not given up on his goal ofgrowing urokinase crystals in space. To pay to continue its research, however,ITA must settle its claim against NASA. In addition to the $8 million claimrelated to STS-107,ITA claims NASA owes the company approximately $12 million because the spaceagency failed to honor a 1996 agreement to carry ITA payloads on multipleshuttle flights. NASAattorney Andrew Falcon confirmed that ITA's claim against the agency is stillpending. He declined to comment on when that claim might be settled on itsmerits. "I am not in a position to comment due to the likelihood of litigation,"Falcon said. ITA'sattorney, Jack Young, said it was too soon to discuss litigation becauseITA is waiting for NASA's response to its claim. "If NASA denies the claimor will not deal fairly with ITA, then ITA will have no choice but to sue infederal court under the Federal Tort Claims Act - something ITA would like toavoid in order to get back to space immediately with its cancer research,"Young wrote in an e-mail to Space News. Anothercompany that lost equipment on the Columbia flight did file suit. In 2005, NASApaid Spacehab $8.2 million in compensation for the loss of a pressurizedresearch module destroyed in the accident. At that time, the Houston-basedcompany said the module's value was much higher and sued NASA for $87.7 million.In 2007, Spacehab withdrew that claim. ITA'sstruggles with NASA did not begin with the Columbia disaster. The company hasbeen striving to send biomedical experiments on shuttle flights for decades.During the 1980s and 1990s, ITA was a pioneer in the space business, providingcustomers with hardware for microgravity research and commercial access tospace. ITA negotiated agreements with space agencies and commercial launchfirms to carry its biomedical research equipment into microgravity, then leasedout the excess room on its flight hardware to corporate and academicresearchers. OnFeb. 6, 1996, ITA signed a Space Act Agreement with NASA. After reviewing ITA'splans to study urokinase, Edward Gabris, director of NASA's space processingdivision, signed a five-year memorandum of agreement to carry ITA's biomedicalexperiments on shuttle flights. "Youstate that eight flight opportunities are required for urokinase productdevelopment and transition to the commercial sector," Gabris wrote Jan.31, 1996, in a letter to ITA regarding the agreement. "This flight numberis reasonable based on the plan's description, but it is also understood thatthe eventual number may vary if conditions change, such as product developmentacceleration due to flight opportunities for extended duration inmicrogravity." Sincethat agreement was signed, however, ITA's urokinase experiments have beencarried on only three shuttle flights. One of those experiments was sent intospace as part of a previous agreement with the University of Alabama,Huntsville. "NASAviolated the Space Act Agreement by flying only one ITA payload during thefive-year period [from 1996 to 2001]. There were some 25 shuttle flights duringthat period," said Cassanto, an aeronautical engineer and Air Forceveteran who oversaw missile and re-entry vehicle programs at General Electricbefore starting his own company. Nevertheless,Cassanto continues pressing the space agency for one last chance to growurokinase crystals on the space shuttle. During a meeting with NASA officialslast September, ITA offered to cut its $20 million claim in half in exchangefor access to another shuttle flight. That offer was declined, Cassanto said. Asa result, ITA is exploring other ways to perform the urokinase experiment,including working with commercial launch providers and international spaceagencies. Unless the NASA claim is paid, however, ITA cannot afford the cost ofhardware, testing and integration needed to send the experiment into space,Cassanto said.